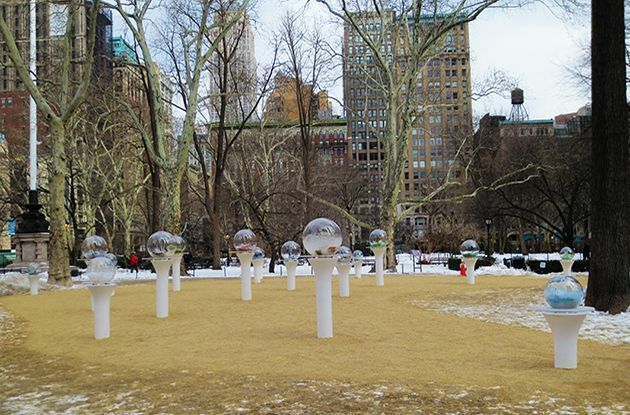 Formed into beauteous objects, Hayes’s crystal balls positioned on elegant fiberglass pedestals summon the present and predict the future. Each see-through globe lit from within features a mixture of analog radio parts, castoff electronic transistor parts, glass vacuum tubes, micro glass beads, shredded rubber tires, and recycled plastic flotsam. To these mixed remnants of technology and culture the artist added crystals and minerals. A shimmering fairy dust was made from pulverized CDs and is layered within each sculpture’s interior. Hayes, who typically works with varieties of plant materials, determined that everyday castoffs are indicative of a society’s behavior and value system and symptomatic of the current landscape.